A large part of the tree will be deadwood in this style, with the remaining branches being supported by living, narrow live strips which provide a lifeline. Trees can be collected with natural driftwood or the effect can be created by bark stripping and carving techniques. It is vital to leave one or more lifelines to transport sap to the living branches. The style can emulate a tree struck by lightning, or one ravaged by disease, strong winds, frost, snow or even where animals have eaten the bark. 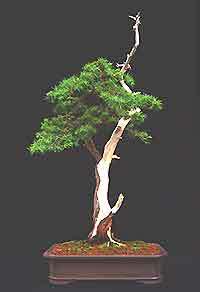 It can also be simulated by attaching a young, whippy sapling to a piece of driftwood and this is usually referred to as a 'wrap-around' or 'Tanuki'. The world's oldest tree is a bristlecone pine which is over 4,600 years old, with the major part of this ancient tree being driftwood.